The amount of debt Americans carry is staggering and grows every day. A prior article explored the kinds and amounts of consumer debt that Americans carry, other than mortgages. Gallup found that only a subset of Americans carries the bulk of consumer debt. This article examines how consumer debt affects different groups of Americans, especially millennials. Two-thirds of Americans say they have enough money to live comfortably, with more traditionalists (76%) and baby boomers (67%) saying they do than millennials (62%) and Gen Xers (61%). Those who say they don't have enough money to live comfortably appear to be using their credit cards to supplement their available resources with high-interest credit. It seems that though their total consumer debt balances are 17% lower than those of Americans who say that they do have enough money to live comfortably, across all generations except traditionalists, Americans who say that they don't have enough money to live comfortably carry 36% larger credit card balances than those who say that they do have enough money. The difference is particularly acute among millennials, where those who say that they don't have enough money to live comfortably carry three times more credit card debt than those who say they do have enough money. Millennials who say they don't have enough money to live comfortably also carry more auto loan debt and personal loan debt than millennials who say they do have enough money. Millennials are the only generation where those who say that they don't have enough money to live comfortably carry 8% more total consumer debt than those who say they do have enough money. 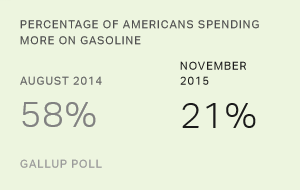 Do Americans Enjoy Saving Money or Spending Money More? 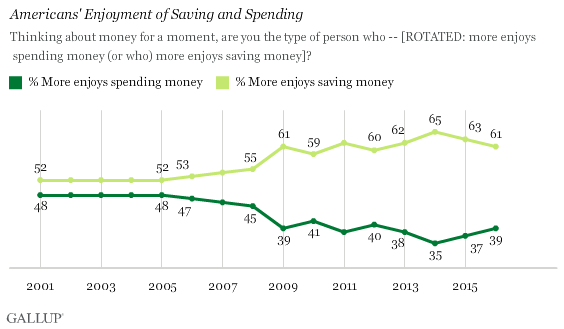 Gallup has been tracking whether Americans enjoy saving money or spending money more since 2001. 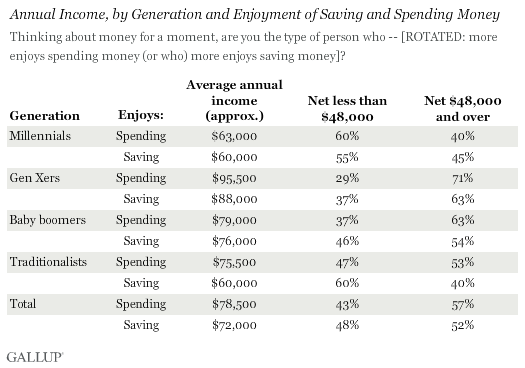 In 2001, 48% of Americans enjoyed spending money more than saving it. The preference for spending money remained at 48% in 2005 and then began a decline, which accelerated during the Great Recession. At the height of the Great Recession in 2009, just 39% of Americans enjoyed spending money more than saving it. The low point for a preference to spend came in 2014, when just 35% said they enjoyed spending money more than saving it. In 2015, the spending preference crept back up to 37%. 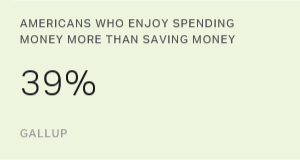 In the current research, 39% of Americans said they enjoy spending money more than saving it, while the remaining 61% enjoy saving money more. Neither of these percentages differs appreciably by generation. Those who say they enjoy spending money more tend to earn more but also carry more debt. Among the generations, those who enjoy spending money more includes a higher proportion of those making $48,000 per year or more than does the group of those who prefer saving money, who include a larger share of those making less than $48,000. The average annual income for spenders is just over $78,500, 9% higher than it is for savers at just over $72,000. The exception is millennials, where the pattern is reversed. Among millennials, savers have a higher proportion of those making $48,000 per year or more than spenders, who have a larger share of those making less than $48,000. Even with this annual income pattern, however, the average annual income of millennial savers is 5% lower than that of millennial spenders. In general, those who enjoy spending money more carry more credit card debt (81% more), more student loan debt (4% more), more auto loan debt (6% more) and more personal loan debt (37% more) than those who prefer saving it. Generationally, the only exceptions to this pattern are among Gen Xers and baby boomers. Gen Xers who enjoy spending money more carry less student loan (24% less) and less auto loan debt (11% less) but double the credit card debt (102% more) and significantly more personal loan debt (75% more) than savers. And baby boomers who enjoy spending money more carry significantly less personal debt (23% less) than those who prefer saving it. Among millennials, those who enjoy spending money more carry more credit card debt (58% more), more student loan debt (23% more), more auto loan debt (26% more) and more personal loan debt (18% more) than millennials who prefer saving. 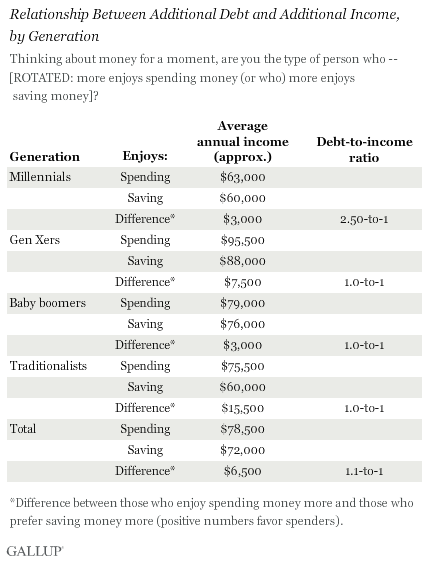 When Gallup compares the differences in income and total consumer debt between those who enjoy spending money more and those who prefer saving it, Gen Xers, baby boomers and traditionalists who enjoy spending money more carry their income difference in additional consumer debt. In other words, the ratio of the difference in total consumer debt divided by the difference in annual income between these two groups is approximately 1.1-to-1 for members of these generations who enjoy spending money more. For millennial spenders, however, the ratio is 2.5-to-1. In other words, millennial spenders carry 2.5 times more consumer debt than the difference in their annual income compared with savers. Almost four in 10 Americans enjoy spending money more than saving it, and they carry a larger debt load across the board though their annual income is higher than those who enjoy saving more. And even among individuals who say that they do not have enough money to live comfortably, almost one-third (32%) still enjoy spending money more than saving it, even if it means piling on more debt, especially credit card debt. This group has among the highest levels of credit card debt -- 60% higher than everyone else. Student loan debt -- though not extremely widespread -- is associated with the highest levels of indebtedness for all generations, but especially for millennials. And as the data illustrate, those with student loan debt are also more likely to take out a car loan, adding to their already-large debt burden. For those with student loans, that debt accounts for an average of 36% of the person's annual income, the largest percentage among all types of consumer debt. On average, total consumer debt accounts for 37% of annual income -- but it accounts for 57% of annual income among those with student loans. This is a staggering percentage when considered against all other personal financial demands, such as mortgage or rent, food, telecommunications (including Internet and cable), insurance, savings and investments, and fuel and auto maintenance, among other expenses. Precious little is left over for discretionary spending, and until only recently, discretionary spending in America had been shrinking. Except for millennials, those who enjoy spending money more than saving match the difference in their annual income (over savers) with the additional consumer debt they carry (over savers). Millennial spenders, though, carry 2.5 times more debt than their income difference over savers. These data suggest that a significant portion of every generation is buried under a mountain of several different kinds of consumer debt. Though sizable slices of each generation carry no debt, the sheer magnitude of how much Americans with debt do owe is a cause for concern. Results of this Gallup Panel survey are based on telephone interviews conducted Aug. 6-Sept. 10, 2015, with a random sample of 3,010 adults, aged 18 and older, living in all 50 U.S. states and the District of Columbia. Interviews are conducted with respondents on landline and cellular phones. All interviews were conducted in English. Each sample of national adults includes a minimum quota of 50% cellphone respondents and 50% landline respondents, with additional minimum quotas by time zone within region. Landline and cellular telephone numbers are selected using random-digit-dial methods. Landline respondents are chosen at random within each household on the basis of which member had the most recent birthday. Samples are weighted to correct for unequal selection probability, nonresponse and double coverage of landline and cellphone users in the two sampling frames. They are also weighted to match the national demographics of gender, age, race, Hispanic ethnicity, education, region, population density and phone status (cellphone only/landline only/both and cellphone mostly). Demographic weighting targets are based on the most recent Current Population Survey figures for the aged 18 and older U.S. population. Phone status targets are based on the most recent National Health Interview Survey. Population density targets are based on the most recent U.S. census. All reported margins of sampling error include the computed design effects for weighting.